Ravenswood is an established community that for 65 years has been a supportive and lively home to people with learning disabilities. As a large local employer, providing some 470 jobs, volunteering opportunities, and facilities for its surrounding communities, Norwood’s Ravenswood is an integrated and valued part of the Wokingham, Crowthorne and Bracknell areas. We took five minutes to chat to Vicki who works as a support worker in the Eretz home at Ravenswood. 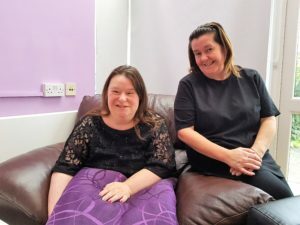 Eretz is a care home housing ten people with learning disabilities and some with physical disabilities – the home was recently rated ‘Good’ by the Care Quality Commission. Then it’s onto personal care and breakfast, followed by a morning activity (this varies daily – there’s a huge variety of activities provided onsite by our Complementary Activities team). Before long it’s lunch followed by either a little rest time for our residents or the option of more activities. Dinner fly’s around, which normally sees all of us (residents and carers) share a meal at the ‘family’ dining table. After that we have some chill out time in evening. That is unless it’s disco night – a huge favourite! The best thing about my job, far and away, is the people we support. They are incredibly compassionate, and often misunderstood. You only need to spend five minutes to see how welcoming they are: they literally greet new comers and visitors with open arms. Are you looking for a rewarding job? Norwood is currently recruiting for roles based at Ravenswood. Search online for ‘Norwood jobs’, visit the website www.norwood.org.uk/careers or come and see us at The Meadows Shopping Centre on Monday, 21 January between 10am and 4pm.